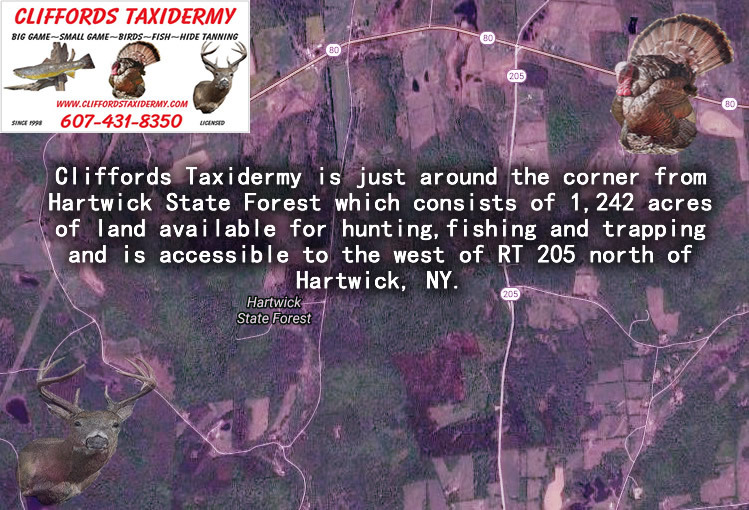 Cliffords Taxidermy is about 15 minute drive from Hartwick State Forest which consists of 1,242 acres of land available for hunting and trapping and can be accessed from RT 205 just north of Hartwick, NY. The forest consist of mixed hardwoods and pine along with clear cut over brushed plots. There is plenty of water supplies located within the border of the state forest. Beavers and waterfowl can found habiting the property. This land provides great opportunity for the bowhunter in the fall. There are also plenty of wild apple trees doting the compounds of Hartwick State Forest. Other access points into Hartwick State Forest is Whitehouse RD north to Curry RD, Dana Clark RD south to Curry RD, Cranberry Bog RD and Whalen Hill RD. Be advise most routes into and through the State Forest are seasonal and require 4×4 or other SUV’s vehicles with ground clearance so watch out for the ruts and pot holes. Wild game that inhabits Hartwick State Land is whitetail deer, turkeys, grouse, squirrel, bobcat, black bear, fisher, raccoon, skunk, opossum, ermine, beaver, mink, coyote and fox. Feel free to use the Hartwick State Forest map provided below.